Hand-Crocheted Wool Hat in Antique White from Peru, "Antique White Winter"
The perfect accessory for keeping you warm during the cold months, this hat is designed by Jose Vivas of Peru. 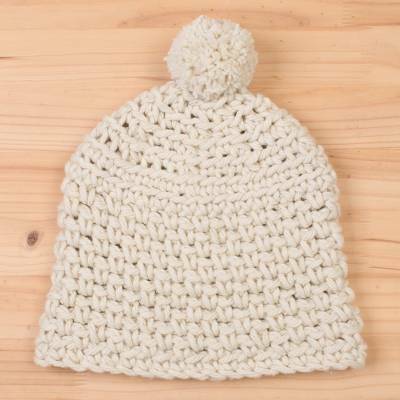 He chooses wool yarns in a luxurious antique white, hand-crocheting it to form the wonderful hat. A pompom completes the hat at the top. "[My wife] and I are working to recover some of our traditional textile techniques, such as knitting and crochet, and trying to share this art form in its most traditional essence." "I was born in Huancayo, known for its beautiful landscapes, its history and its arts and crafts. I consider myself an entrepreneur and my goals are well defined. I'm a hardworking man and fight to overcome the adversities that appear on my path. "I grew up in a loving family and I've been fortunate to be able to experience these beautiful family relationships. "The textile arts practiced in my town are incredible. It was great to see the many items for sale in weekly street markets. There was hand-spun yarn, knitted apparel and accessories like scarves, hats and gloves. A person might not even notice any special design because they were everywhere. "While I was still a boy, we moved to a smaller city where the seasons changed throughout the year. It was always pretty and inviting. Since then, I've traveled through Peru with my mother, Martha, who is an agronomy engineer. We visited many towns and small cities where she taught courses and worked on development projects. On these trips, I learned more about the handcrafted textile work of my country. All the colors and textures, and the traditional designs were fascinating. "Peru is rich in resources, and my ancestors learned to use each of them to survive. The need for warm clothing led to our legendary pre-Inca weavings that evolved into a highly developed art form. Artisans adapted different trends, playing with colors and shapes, according to their individual regions and cultures. "When I was 15 years old, I finished secondary school and moved to the capital. Inspired by my experiences while traveling with my mother, I decided to follow my passion. I was very sure about what I wanted to do and I studied textile engineering. I wanted to be able to contribute something to the development of textiles in my country and give people the opportunity to work with them. "While developing this project, I met Annie, who now is my wife and mother of our daughter born in 2015. Today with my mother and four other artisans, Annie and I are working to recover some of our traditional textile techniques, such as knitting and crochet, using them in current trends, and trying to share this art form in its most traditional essence. We work with artisans from our community, offering fair and equal payment and treatment. "We begin with the raw fibers, developing colors according to our designs, and then we create samples until we achieve our desired model. This is when a design goes into the production stage. From 100 percent Andean alpaca to different alpaca blends, the yarns are chosen to create the fabric's required textures, "feel" and fall. "We plan to keep working hard, and want our team to grow so that our art can reach the whole world. We're excited to work with Novica and promise we'll do our best to satisfy your needs."